Banking-grade Investor Risk Profiling and Product Risk Classification Now Available for Cryptocurrencies - Coinfomania Coinfomania: Where blockchain and cryptos live. 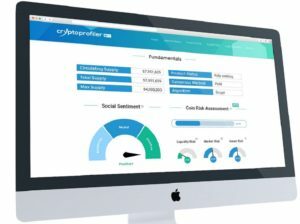 Cryptoprofiler empowers better investment decisions in cryptocurrencies by providing investors with risk profiling, social sentiment analysis, and cryptocurrency risk classification. While early-stage crypto investors have multiplied their investments, many people who have started a couple of months ago have suffered heavy losses in their crypto portfolios. Cryptoprofiler bridges the gap of investor protection framework between the traditional investment world and crypto space, by transferring investor risk profiling into the latter. In addition, the product risk classification provides insights into market risk, liquidity risk and product risk of cryptocurrencies. The beta solution provides a light version of the suitability assessment to determine an investor’s knowledge, experience, risk capacity, and risk tolerance. The more comprehensive and in-depth assessment will become shortly available to users in the login area. Learning resources covering crypto risks and behavioral biases are aimed to enhance investor understanding of the dynamic crypto market. The latest feature is a portfolio risk analysis tool with an alert function.